It has been said that soccer matches are as unpredictable as blind dates. And that was never truer that in the last game for the 2016 European Championship between France and Portugal. By almost all criteria—quality as a team, recent victory over Germany, game being played in France and seasoned players—France should have been victorious. But Fate, as coquettish as an adolescent in love, proved otherwise and Portugal became the winner. There was a nice side to a probable French victory, since almost half of whose players are of African origin. As John Carlin, writing for the Spanish newspaper El País, has stated: Some French players are Muslim, with names like Mandanda, Rami, Umtiti, Matuidi, N’Golo, Sissoko and Pogba. Even Griezmann, France’s The Little Prince, come from an immigrant family. Griezmann’s maternal grandfather, Amaro Lopes, was a Portuguese football player who emigrated to France and initially found work in a construction site. Griezmann’s sister Maud has become a symbol of resistance against human evil, since she is one of the survivors of the terrorist attacks in Paris Bataclan Hall, in which 90 people died last November. A victory by France would have ended the arguments brandished by Jean-Marie Le Pen, the founder of the National Front, accusing French national team players that they don’t feel patriotic enough because of their origins. Alas, it wasn’t to be. 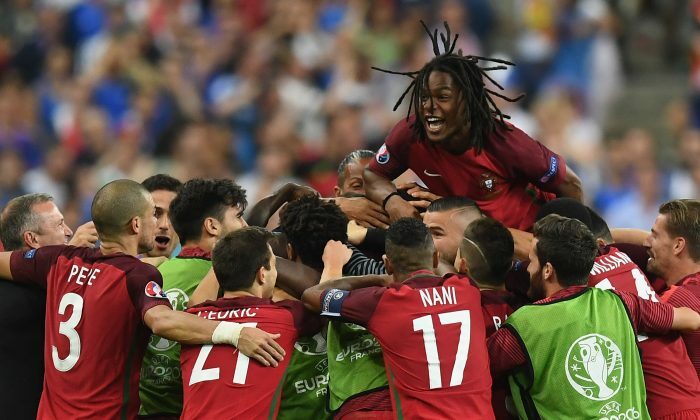 Although Portugal was a technically inferior team to the French team, the Portuguese managed a stunning 1–0 victory over the French, and Portugal was crowned Euro champion for the first time in its history. The French team not only dominated over the Portuguese team, but Portuguese star Cristiano Ronaldo (CR7) was hit by France’s Dimitri Payet after only 8 minutes of the first half. He continued on the field for a few more minutes until, unable to play any longer, he had to leave the court. He was finally replaced by Ricardo Quaresma after 23 minutes of the first half. It was a devastating loss for Portugal. For the rest of the game France drove the ball, but couldn’t unsettle the rigorous Portuguese defense. Several shots by the French players were stopped by the remarkable interventions of the Portuguese goalkeeper, Rui Patricio, who became the star of the game. Since the game finished on a tie in regulation time, two additional 15 minutes had to be played. In the second half of 15 minutes a cannonball shot by Éder made Portugal the winner. His right-footed shot from 25 yards out momentarily froze France’s goalkeeper, Hugo Lloris. He dove to his right but the ball eluded him and went inside the net. Being sure of a victory, the French organizers had prepared a huge bus to transport the players with the legend: “Merci, Champions D’Europe 2016”. It is possible that after this final result, the bus will end up rotting somewhere in the French countryside. Dr. Cesar Chelala is a soccer fan.